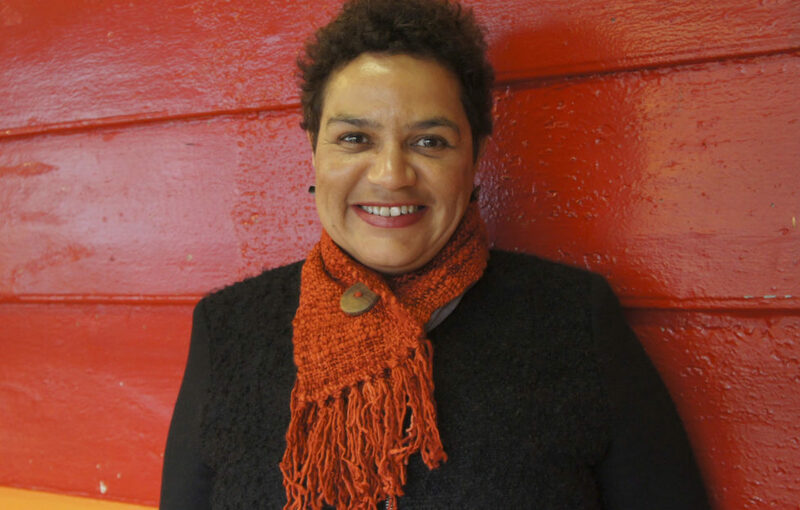 Two years ago, the award-winning Glaswegian writer Jackie Kay was appointed Scotland’s Makar. The Scottish Government-appointed post of Makar lasts for five years, and though the highlights so far have been many, one in particular stands out. “Reading my specially-written poem – Threshold – in front of my parents at the opening of the Scottish Parliament in July 2016 was a highlight.“The Queen was also in attendance and one stanza of my poem says: Good day Ma’am, Ma’am, good day, Good morning Helen and John Kay. It was lovely to be able to include my parents, who adopted me when I was only days old, in the same verse as the Queen. “They’re very proud of me,” Jackie continues. “But I’m as proud of them as they are of me. I’m so lucky to have John and Helen Kay as my mum and dad. 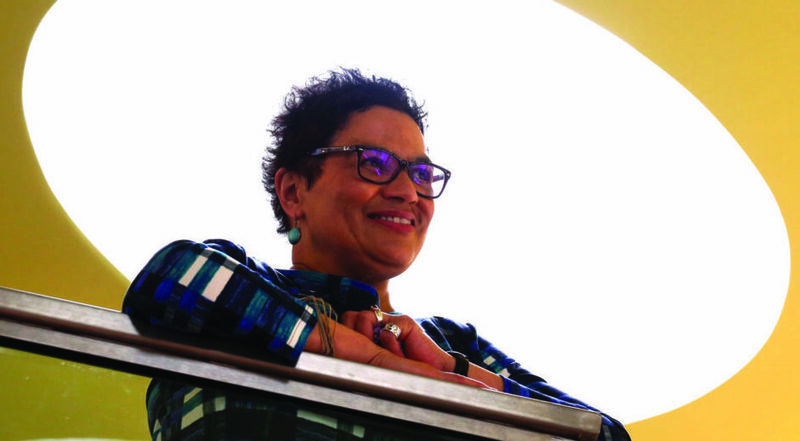 However, Jackie Kay MBE has no shortage of achievements against her name. Among her long list of highly-acclaimed work, she has won awards for a collection of poetry, The Adoption Papers; her first novel, Trumpet; and bestselling memoir, Red Dust Road. “As the third Makar, I’m following in the footsteps of two wonderful poets who I first met in the early days of my writing – Edwin Morgan and Liz Lochhead,” says Jackie. 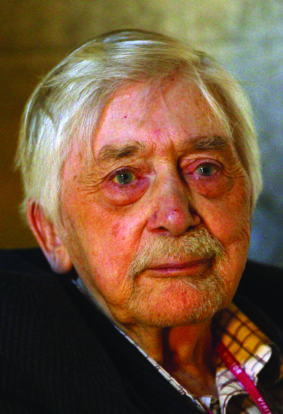 “Edwin Morgan was a fabulous human being and poet. Latterly, Mum and I would visit him in his nursing home where we always had great discussions about poetry. “Liz is such a good friend. She’s been a huge influence on me and has always been there – one of the first poetry readings I ever did was in Scunthorpe with Liz. In fact, it was Alasdair who recognised Jackie’s talent. He also inspired the then 17-year-old to follow a career in writing rather than acting. Having very successfully lived up to Alasdair Gray’s words, as Makar, Jackie is keen to encourage Scotland’s next generation of writers. Jackie explains that she can shape the role of Makar as she wishes – even doing a poetry reading at the remote Rannoch train station! “I have a lot of freedom. In my five years as Makar, I want to do lots of different things, including bringing poetry to unexpected places. 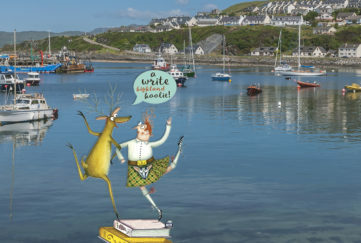 “It’s my ambition to get round as many of Scotland’s islands as possible so I can stitch together a tapestry of poems, with a stanza about each island. So far, I’ve been to Shetland, Harris, Lewis and Uist. I had a wonderful time in these islands, with people coming from all over to hear me. “Being Makar enables me to get out and about and talk to people and I love that – and I’m continually surprised by how everyone’s embraced the word ‘Makar’. “Poetry should play an active role in public life. Particularly at the moment when things are becoming increasingly worrying across the world. It’s vital to have a strong alternative voice and that voice could be poetry. “I’d like to get a number of poets to write a poem on a topical issue. We’d then attend the Scottish Parliament so the MSPs could listen to poets instead of other politicians. “And I’d like to do a whisky tour of Scotland with a few poets when we would all write poems about whisky,” laughs Jackie, expertly moving back into lighter territory. 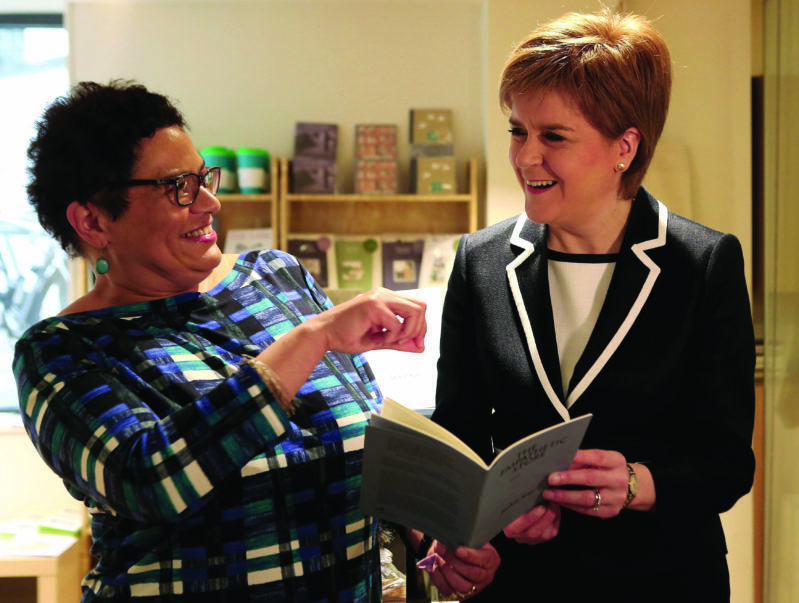 Jackie shows First Minister Nicola Sturgeon at the Scottish Poetry Library in Edinburgh. As well as being Makar, a writer and a poet, Jackie is also the Chancellor of Salford University. “I live between my own house in Manchester and my parents’ home in Bishopbriggs,” says Jackie. Helen and John Kay had also adopted Maxwell as a baby. They are passionate Communists, which perhaps explains why so many of Jackie’s memories feature political marches, which she admits aren’t a typical childhood pastime. 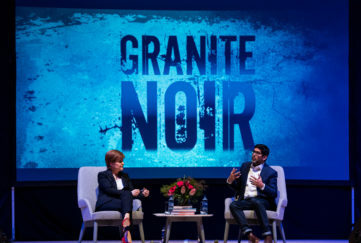 “I loved meeting at George Square and marching against apartheid, for peace, for the shipbuilders, shouting out chants and meeting up with other people,” she says. “And I loved our family holidays. We would go to all these different places – Mull, Campbelltown, Torridon, Lochinver, even as far as Devon. “Of course, my childhood wasn’t always rosy. It wasn’t easy being a black kid – and a lesbian teenager – in Scotland in the 70s. There was a lot of name-calling and bullying. Some kids were expelled from school because of things they did to me. “But it’s now 2017 and I’m 55 and lots of people have tricky childhoods. “My son had a very different childhood to me. He grew up in an area where there were lots of black people. He possibly shared my feelings of being different from other children – but for Matthew, that was because his mum was a lesbian rather than his colour. Jackie grew up knowing she was adopted and that her birth father was Nigerian and her birth mother Scottish. 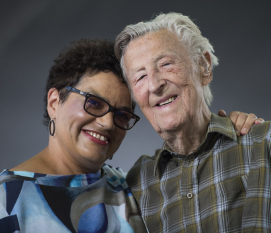 “I feel strongly Scottish and strongly Nigerian,” explains Jackie, who wrote about finding her birth parents in Red Dust Road, a book she describes as “a love letter to my adoptive parents”. “When I’m in Nigeria, despite having been born and brought up in Scotland, I feel strangely at home. However, people from more than one place often find that happens. That’s probably going to be the way of the world. “In years to come, I think people like George Mackay Brown, who never move from the place of their birth, are going to be very, very unusual. A Write Highland Hoolie, November 9-11. 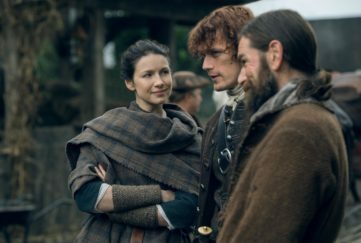 This interview originally appeared in The Scots Magazine March 2017 issue.